In many ways the great cities of Tokyo and Osaka share a number of key characteristics. For a start they are both immense with Tokyo boasting some 13 million people with a local zip code and Osaka weighing in at a very respectable 8 million, equivalent to the size of London. Osaka makes better okonomiyaki but Tokyo has the choice of finer wines. The standard phrase for good morning in Tokyo is pretty much "good morning" whereas in Osaka you'll ask "are you making money?" Osaka were the merchants and Tokyo the administration. As in many countries both the accent and the vocabulary differ significantly over the 500km dividing the two cities though many will insist there is only one "Japanese". The differences can indeed be so extreme that it becomes impossible to use the phone and I've actually seen people give up and communicate by fax (this was a while ago). But the populations of both love their golf and karaoke and sake is a binding passion. 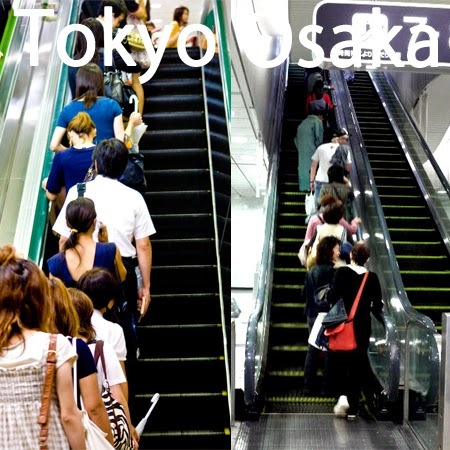 However, one curious difference is that, although both city's inhabitants predominantly commute by subway, on returning to the surface on any of the thousands of escalators, Tokyoites stand on the left and Osakians stand on the right. But now the local Osaka Government has decided to convert the entire population to standing on the left to align with Tokyo in time for the 2020 Olympics. There's even the threat of a warning to be followed by a modest fine for repeat offenders. Seriously guys, good luck with that one. Grab your video cameras, you're about to witness civil disobedience Kansai style. Standing on the right.